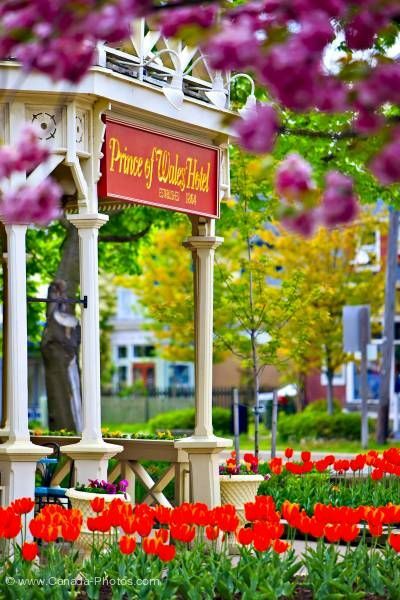 Photo of beautiful red tulips, Tulipa, growing at the entrance to the Prince of Wales Hotel (built in 1864) in the town of Niagara on the Lake, Ontario, Canada. Rows of bright red tulips decorate the lawn of the entrance to the charming Prince of Wales Hotel. This hotel is part of the beautiful town of Niagara-on-the-Lake in Ontario. Just beyond the tulips is the attractive entrance to the hotel with its gold and red sign and inviting open porch.